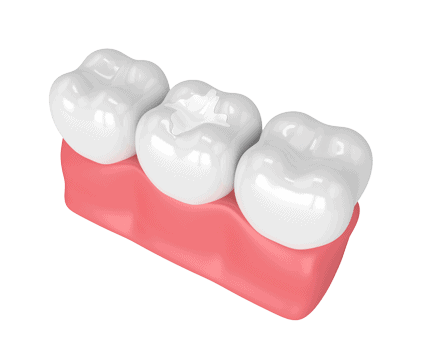 Our teeth have many tiny crevices that occur naturally particularly on back molars. These mini canyons trap food that is tough to get rid of no matter how great our children brush and floss. Those tiny particles of food are just what decay needs to get started staining and eating away at the enamel of the teeth. Dental sealants are a long-lasting protective barrier that keeps food from becoming trapped in those crevices. By reducing the food source for the cavity-causing bacteria, we can help prevent the development of dental caries (tooth decay). Sealants are a clear liquid plastic that can be applied to both baby and adult teeth, usually focusing on the molars. Sealants should be placed prior to any decay gaining hold so the earlier the better for prevention sake. Applying dental sealants is an easy and pain-free process. First, we apply a gel that prepares the tooth surface to make sure the sealant adheres properly. Second, your dental team will apply the sealant material with a tiny brush and.a special light is used to “cure” the sealant and create that protective coating. dental Sealants can last several years and often even into adulthood. Typically the lifespan of a sealant is about three to five years. At each preventative cleaning visit, we will check to ensure they are still providing the best protection. Occasionally we may recommend a reapplication if necessary. Toothbrushing alone isn’t the only defense in the prevention of childhood decay. Overall, dental sealants are an excellent treatment option that can save money, time and prevent the need for more invasive intervention down the road.